Fondue is a classic recipe for Valentine’s Day. It’s perfect for dipping, eating, chatting, and spending time with your special someone. 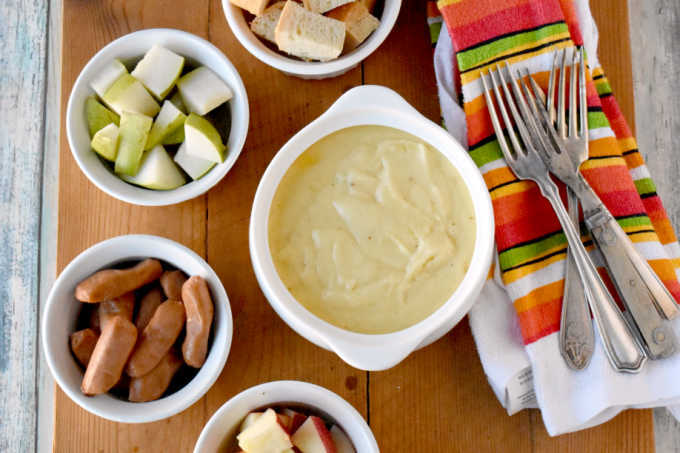 This Smoked Gouda Fondue boasts a deliciously smoky flavor you will love. I have no idea how or why fondue because associated with romantic dates or dates in general. Maybe it’s the way you eat fondue or the fact that it’s something to nibble on for a while. Or possibly it’s the chocolate fondue? Either way, when I think of a romantic date, say for Valentine’s Day, I think of fondue. For us in the US, after about the 50’s fondue is known as more of a style of eating than it is a dish. Basically, if you dip anything into a communal pot of liquid, be it cheese sauce, chocolate, or broth/oil, we call it fondue. But, technically, only the cheese is traditional fondue. However, none of this actually explains why fondue is typically known as a romantic or date night meal. So, that leads one to ponder. Since I haven’t been to that restaurant that only sells fondue, I can only guess at why it’s a date night dinner. First, you have one pot to eat out of. I mean, if that’s not getting close and personal with someone, I don’t know what is. You put your bread, meat, or veggies on these long forks and dip them into the fondue. Do you put it on a plate after you dip it? I would probably just eat it off the fork, but some might be squeamish about that. Fondue is something you eat slowly. I mean, from what I can gather, it can take hours at those restaurants. If you have an appetizer, main dish, and dessert, I guess it could take a while to eat dinner. This means lots of time to get to know one another or just spend time together. I guess I’m starting to see how this could be a great date night meal. Fondue is probably not something you’ll be texting or playing on your phone while you’re eating, too. It’s very hands on. You put the food on the fork, then dip it into the pot, then eat it. Again, do you put it on the plate? Is that proper etiquette? I have no idea. I probably would if I’m eating with someone I’m not completely familiar with. And there’s no way I would go in for a double dip or go for more if the other person double dipped. However, if it’s my husband, then all bets are off. The earliest mention of fondue dates to the 17th century in Zurich which talks about cooking cheese with wine. Traditional fondue as it’s known today dates to the 19th century. It’s the Swiss national dish. 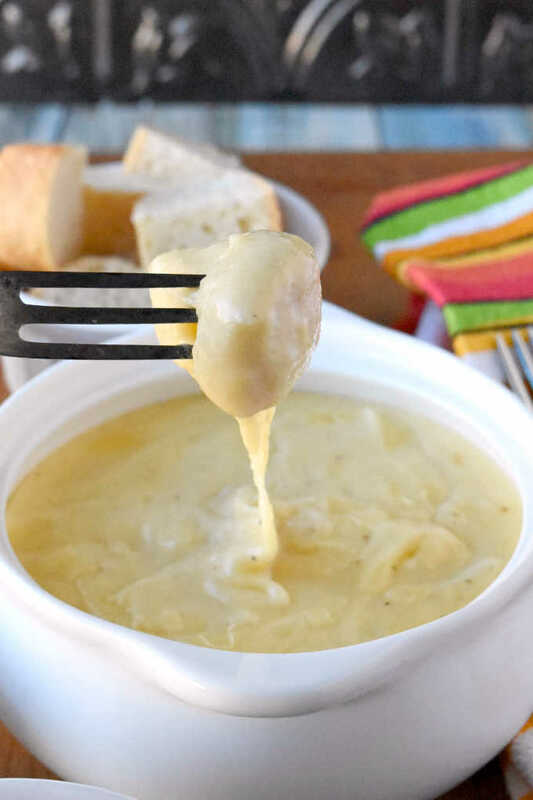 Cornstarch was added in the 1900s which makes for a creamier and more smooth fondue. Fondue was promoted at the 1964 New York World’s Fair in the Swiss Pavilion. The Chalet Suisse restaurant introduced fondue bourguignonne along with chocolate fondue. For those that think that fondue is just for the restaurants, that’s a cop out. It took me maybe 40 minutes start to finish. And yes, that includes shredding the cheese by hand. You have no excuse! 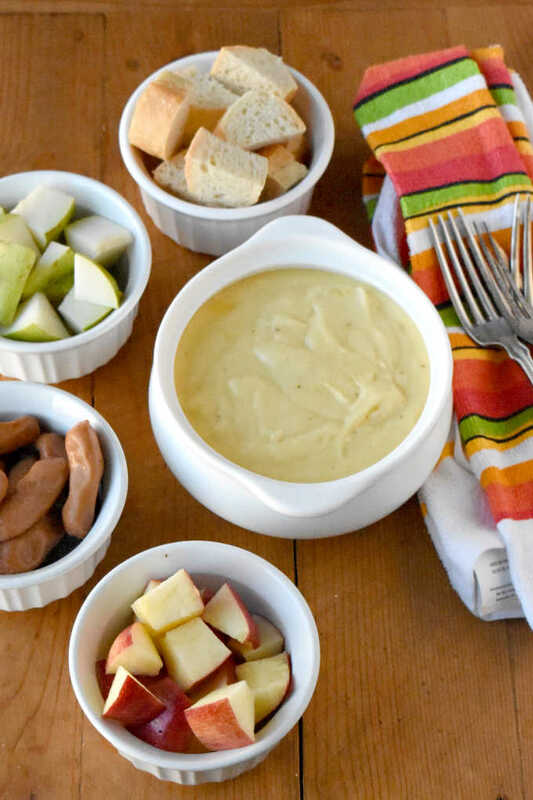 Get in your kitchen and whip up this fondue for your special someone this Valentine’s Day! I think all fondue has to have Swiss cheese in it. I could be wrong. All fondue should have at least one hard cheese for flavor and one smooth cheese for creaminess. I chose Swiss for the creaminess and the smoked gouda for the flavor. It was the perfect pairing! The fondue had a slightly smoky flavor with a creamy and smooth texture that was out of this world. I have not eaten, nor have I made fondue until now. So, again, you have no excuse. If I can make it then you can make it. It’s wine (or broth), garlic, dry mustard (or some Dijon mustard), cheese, and cornstarch. That doesn’t sound difficult at all does it? Of course not. So, get in your kitchen and cook some up for Valentine’s Day dinner! Don’t get the pre-shredded cheese. It typically is coated with something to prevent it from sticking together and might make for a super thick fondue. Not a good thing. Make sure your cheese is thoroughly coated in the cornstarch. Take your time!! Do not, I repeat DO NOT, dump all the cheese in at once. Add a small handful, stir, and stir, and stir some more until it’s melted and creamy before adding another small handful. If you have any leftover, you can refrigerate and then reheat slowly in a small pot on the stove. Make sure to watch and stir frequently so it doesn’t stick to the bottom of the pot. 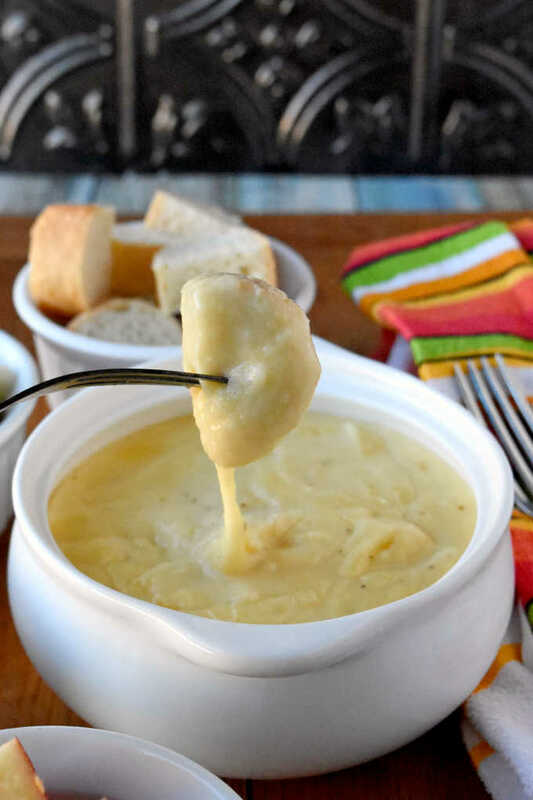 You can use leftover fondue to make killer macaroni and cheese! That wine and cheese would pair well with a delicious shrimp or lobster macaroni and cheese. Just saying. You see what I mean about the creamy and delicious? And that’s just a small piece of bread. Imagine that with apples, pears, sausages or salamis. Oh yeah baby! That ooey gooey delicious cheesiness is just dripping off that piece of bread. I’m drooling. Aren’t you? I know you are. Just admit it. By all means, please do think outside the box about items to dip into the cheese. Bread, pretzels (hard and soft), sausage and salami, veggies and fruits; heck chicken strips and wings if you wanted. Get the kids involved with hot dogs and fish sticks. Or large pieces of pasta like ziti or rigatoni. The sky truly is the limit with your fondue dippers. We hope you get some Valentine’s Day inspiration this week. Yes, I know it’s not for a couple of weeks, but a person has to plan for a romantic meal, right? At least this recipe will be easy to whip up with common ingredients. Visit the rest of the bloggers participating in the event this week. They’re sharing some delicious recipes for you Valentine’s Day parties or date nights. Fondue is a classic recipe for Valentine's Day. It's perfect for dipping, eating, chatting, and spending time with your special someone. 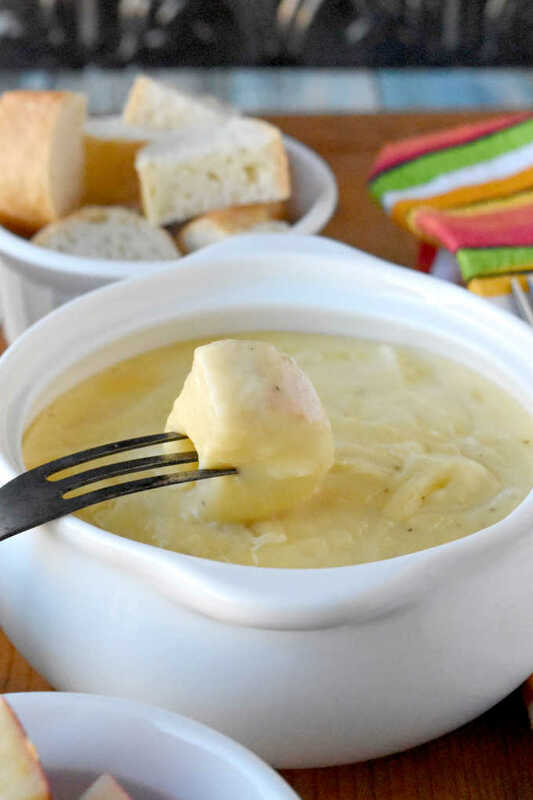 This Smoked Gouda Fondue boasts a deliciously smoky flavor you will love. wine garlic lemon juice to a simmer. 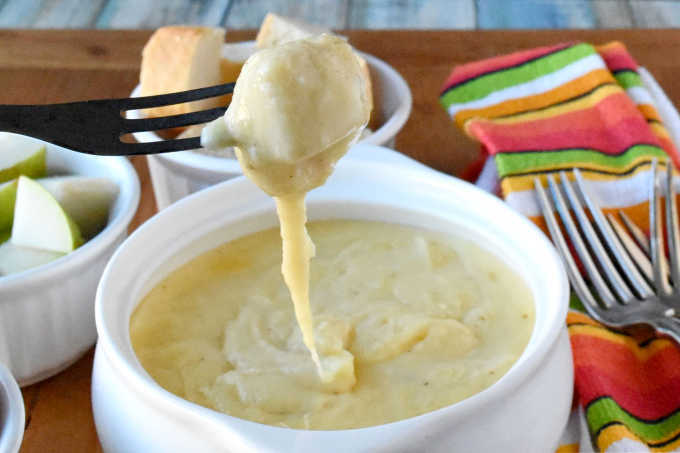 Gouda job with this amazing fondue! Reminds me of Switzerland. This is a fun idea for Valentine’s Day. 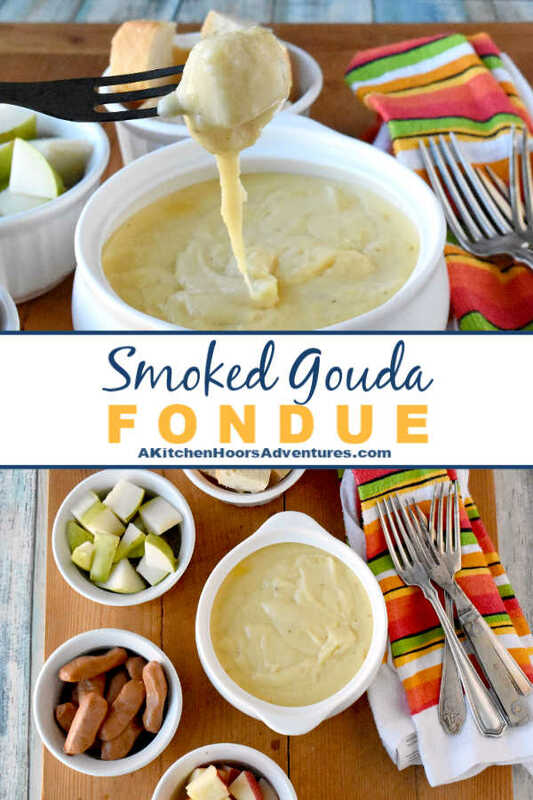 I love smoked Gouda and I have a fondue pot. Game on! Sweet! I hope you enjoy it as much as we did! My daughter loves fondue and smoked gouda. I know she would be over-the-top for this! I’ve never made fondue before but this sounds wonderful! I hadn’t either, but it was surprisingly simple to make. You should try it! I had a fondue pot for years from the 1970s with the long handled fondue forks. Wonder what happened to it! Now I want to use it with your recipe! 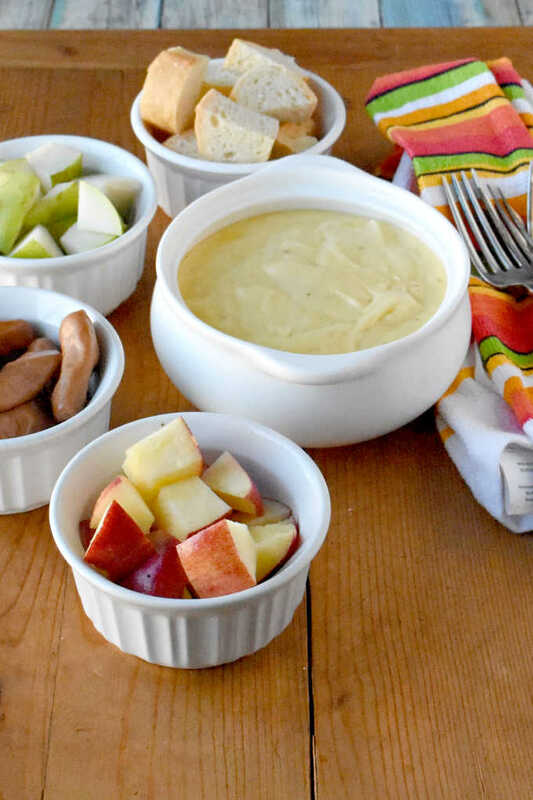 You are totally right – fondue is totally tied to date night. My husband made it for me once at home, when we were dating, but your dip is making me want to make it for him sometime soon. I hope you do! It’s so good and super easy to make. I’m using the leftovers for insane mac and cheese.